Bristling with intensity, this latest offering from French-Canadian director Denis Villeneuve (Incendies, Prisoners) is very much in the vein of Steven Soderbergh’s Traffic in that it also addresses the futility of the so-called ‘war on drugs’. This pulsating drama tracks a cabal of law enforcement officers as they set forth on a mission to restore some sense of order to the supply channels into America rather than simply continue with their ineffective efforts targeting those at the end of the distribution chain whose arrest and incarceration has little impact on the manufacture and supply of narcotics. 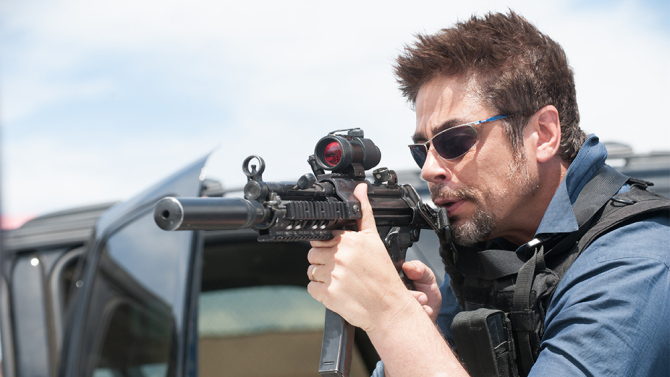 In fact, some 15 years later, Sicario sits very well as a companion piece to Traffic as an update on the state of play and the increasingly sophisticated tactics from both sides of this seemingly perpetual battle in which notions of right and wrong are becoming increasingly blurry. 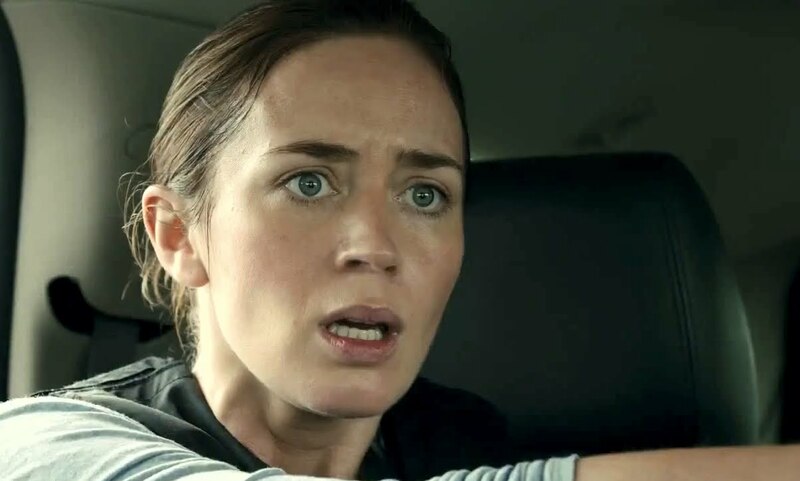 We are introduced to FBI agent Kate Macer (Emily Blunt) via an opening scene in which she leads a raid on a house in suburban Phoenix in a bid to extricate hostages, only to be met with something else entirely. She is subsequently recruited onto an elite task force targeting the increasing influence of lethal drug cartels along the U.S-Mexico border. However, it doesn’t take long before she realizes there is much more to this group, and their mission, than she bargained for. The task force is led by the footloose, swaggering Matt Graver (Josh Brolin in his best performance for some time) and includes the mysterious Alejandro (Benicio Del Toro), whose personal agenda just happens to fit nicely with Graver’s mission to track down and eliminate the leaders of the Mexican cartels, although Kate soon discovers that the intention is not simply to wipe out drug dealers and she subsequently finds herself both complicit and compromised. With set pieces and beautifully choreographed sequences that seem indebted to Michael Mann and eerie night-vision sequences akin to those in Katheryn Bigelow’s Zero Dark Thirty, Villeneuve has created a pulsating drama that is relentless in its intensity. Whilst this is not an action film per se, there are some fantastically executed scenes bristling with tension and bloodshed, none more so than a spectacular sequence in which a convoy of vehicles transporting the task force becomes enmeshed in a traffic-jam that leaves them exposed and vulnerable to attack. Yes, the film is violent, but not in an over-the-top Rambo kind of way. The vision of mutilated bodies hanging from overpasses is a reflection of the reality we see in news feeds every day. Cinematographer Roger Deakins superbly articulates the geographical encumbrances endured in a battle to protect the borders with majestic aerial shots that emphatically demonstrate the vastness of a barren landscape almost impossible to police effectively. Equally impressive from this 12-time Oscar-nominated Englishman is the way in which he uses the camera – in concert with a musical score from Icelandic composer Jóhann Jóhannsson – to engender an energy to everything that happens. All the actors deliver knockout performances and Del Toro, who picked up an Academy Award for his role in Traffic, may find himself in the running once again with this eerily effective portrayal of a man whose personal mission just happens to suit the needs of those who might ordinarily be his archenemy. Every time he is on the screen he commands your attention, even when he is doing nothing. There are a few shortcomings that can’t be ignored, not the least of which is the fact that Kate’s by-the-book approach and inability to emotionally distance herself from what she experiences suggests that, as a woman (and the only female on the team), she is somehow weaker and less competent than the men around her, a fact that is further emphasised when it is revealed that her inclusion in the operation has less to do with her ability and more to do with being the scapegoat who ultimately legitimises (under considerable duress mind you) the unorthodox and undeniably illegal tactics employed in executing the mission. Working from a script by actor and screenwriter Taylor Sheridan that is brimming with terrific exchanges – such as when Kate asks Alejandro what’s going on and he replies “You’re asking me how a watch works. 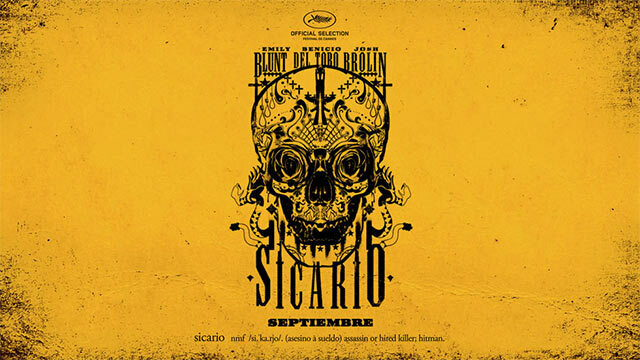 Just keep an eye on the time” – everybody involved here is at the peak of their powers and, as a result, Sicario emerges as a riveting and haunting exploration of the moral and legal ambiguities that surround any effort to infiltrate the criminal underworld.